Oil-free baked falafel bowls! The perfect detox meal after a weekend of eating too much, drinking too much, and generally ignoring any and all personal health goals. Since I spent the weekend chowing down on vegan oatmeal cream pies the size of my face, I’ll be making these baked falafel bowls for lunch all week to get back on track. I packed as much green as I could into these baked falafel bowls. The falafel itself is made with tons of kale and parsley. 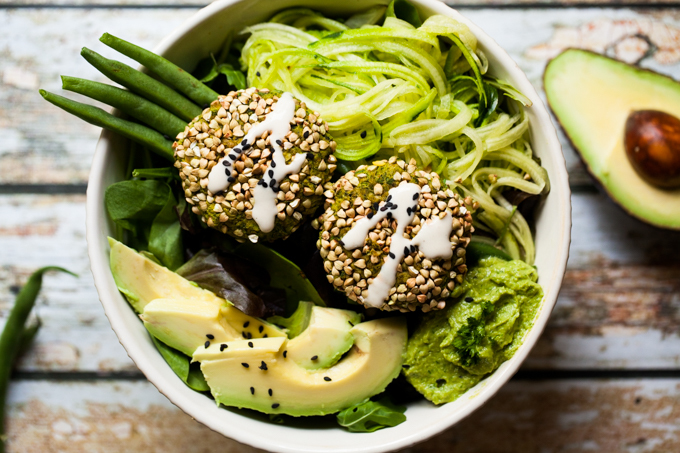 The bowls are filled with spiralized cucumber, crunchy raw green beans, mixed greens, baby kale, and a healthy scoop of my favorite parsley hummus. I coated the falafels in buckwheat groats to add a bit crunch without using oil. It worked beautifully! I’m definitely going to be working these groats into future dishes. Also, can we please talk about spiralized cucumber? It’s my new favorite way to eat cucumber in a salad. I’m dreaming up more raw dishes this week just to work in spiralized cucumber! I’ve also noticed that the more raw foods I eat, the more energy I have. While I don’t aspire to be 100% raw, I’m always interested in feeling better and more energized! If you make these Supergreen Baked Falafel Bowls, be sure to rate them in the comments below so we know how yours turned out! While you’re at it, post a photo to Instagram with the tag #carrotsandflowers so we can admire your green beauties! A delicious and healthy detox meal! Supergreen baked falafel packed with kale and tons of flavor. Vegan, gluten-free, and oil-free. Form the falafel mixture into 2 inch balls, then flatten them slightly into thick discs. Coat the falafels in the buckwheat groats, pushing the groats into the falafel so they stick. Bake the falafels at 350F for 15 minutes, then flip them and bake for an additional 15 minutes. Meanwhile, trim the ends of the green beans and spiralize the cucumbers. Divide the baby kale and mixed greens into 4 bowls and garnish them with sliced avocado and spiralized cucumbers. To save these Supergreen Baked Falafel Bowls for later, simply pin the photo below!